Want to create some amazing photo effects? Here's the apps to help you achieve them. There are hundreds upon hundreds of different photo editing apps for iOS in the App Store. So, how would you know which ones are worth trying out? Well, I thought I’d help you out by running through my personal top ten photo editing apps. Check out my video rundown below. Despite all of the expensive camera equipment I own, my iPhone is my primary camera. This is due to it always being by my side no matter where I am, and because of how easy it is to take and edit pictures. Out of all of the photo editing apps I’ve tried over the years, here’s a list of my top ten — in no particular order. It’s one of the top iPhone photography apps out there. Not only is it incredibly straightforward to use, but it also offers a surprisingly powerful range of tools you can use to give your pictures that professional finish. As it’s name suggests, TouchRetouch is all about retouching your photos to remove any unwanted elements. Simply touch the object or part of an object you want to remove, after which the app will remove it and replace it with pixels from the surrounding area. Enlight has just about every basic or advanced editing tool you could hope for, whether it’s for serious work or something a bit more fun or artistic. There are plenty of good apps for letting you apply textures and other creative effects to your photos, but Mextures is possibly the one you’ll hear mentioned the most. And with good reason, too! It boasts an impressive range of light leaks, grains, textures, and other ways to transform your photos. VSCO is a camera app as well as a photo-editor, but it’s got plenty of editing tools and filters that help it stand out. What I like about VSCO is the fact that the filters are designed to look like classic and modern analog films, so you’ll get a slightly retro, faded look which will subtly enhance any pictures you take. Superimpose is a great tool for compositing multiple different pictures into one and, while there’s a bit of a learning curve, you should be up and running inside of an hour. You’ve probably heard of Prisma by now. It uses artificial intelligence in the form of a mix of neural networks and cloud-based machine learning to turn your photos into approximations of the work of artists like Munch or Picasso. Sure, other apps have made similar claims — but the results here really are as impressive as you’d hope. Pixelmator has a sterling reputation — and it’s not hard to see why. 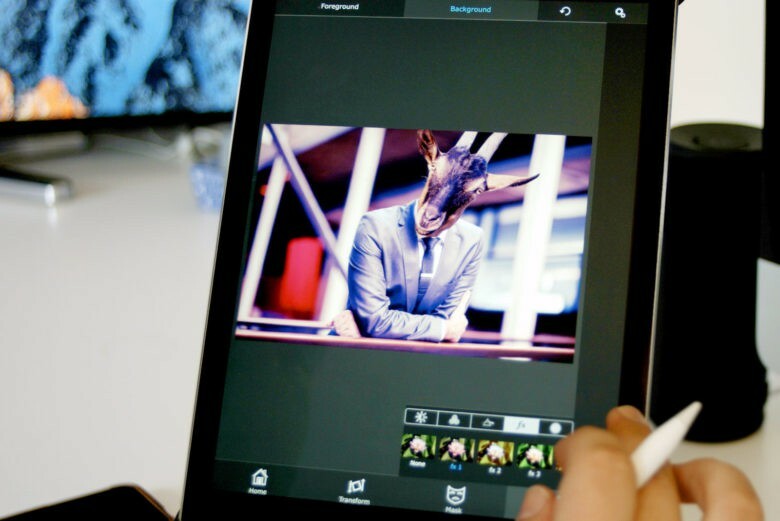 Whether it’s cropping, straightening, combining images, adding effects, or whatever else, Pixelmator for iPad is one of the best tablet-based graphics apps on the market. Okay, so it’s not quite on a par with Photoshop, but I’m constantly impressed by everything that it can do. And at just $4.99, it’s certainly a bit cheaper than going down the Adobe route. Looking for a way to not simply blend photos together, but photos and video at the same time? If so, Fused is probably your answer. It’s an original concept — and it is executed tremendously. Finally, did you really think I was going to leave this off the list? Instagram is easy to dismiss as a basic filter app — but it’s come a long, long way since those early days. If you’ve not used it in a while, it’s definitely worth revisiting. As well as increased filters, Instagram now offers some pretty impressive photo editing tools, as well. A majority of the images used for this video were downloaded from Graphicstock.com. Graphicstock is an amazing site for all of the royalty free resources you could possibly need to help edit your photos. Get your free 7 day trial here. For more in-depth tutorials of some of these apps check out our previous article. Also make sure to subscribe to the Cult of Mac YouTube channel to stay up to date with all of the latest videos from Cult of Mac.